dbSNP: From dbSNP: Users may now query genotypes for 1 or more snps by rs#, chromosome location, or gene Id. SNP properties and populations are specified prior to retrieval. Output includes HTML, XML, Text and HaploView format by population. Connotea: Ben Lund has created a new (beta) tool for connotea called Notea: Notea is a Firefox Extension for storing and organizing local copies of online works. It optionally integrates with Connotea to allow easy sharing of bookmarks for your locally stored works . Comics: want to know more about North Korea ? 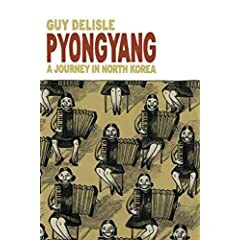 Do read this comics : "Pyongyang: A Journey to North Korea." Comics: 300, a film based on Frank Miller's graphic novel 300 about the the battle of thermopylae will be in theaters in 2007. The comparison between the book and the movie is astonishing !